Cinemania - 9.2006 Alatriste El gran heroe espanol. On guard! Viggo Mortensen takes on the Golden Age in the guise of Arturo Perez-Reverte's popular character, a soldier of fortune that Agusti­n Di­az Yanes has translated onto the big screen. The year of our Lord 2006. After more than a century of valiant but futile resistance against the Empire, something flickers in far-off Spain. A spark of rebellion spreads like gunfire and threatens the powerful cinematographic imperial forces that dominate the world from the hills of Hollywood thanks to their special effects, their two-bit superheroes, their dumb romantic comedies and their flashy stars. It's very difficult to defeat such brute strength. Captain Alatriste has arrived. At long last the banners of Spanish Cinema unfurl and wave. The Imperialists quake in terror. "Something is happening to our history. It's like there's a kind of disconnection with the past, or something like that," Di­az Yanes suggests (Madrid, 1950), director of the unforgettable Nobody Will Speak of Us When We're Dead (1995) and No News From God (2001), now embarking upon the complex task of reinventing for the big screen one of the most widely read Spanish fictional characters, a dark hero from 400 years ago. "Notice what movies are being made in England and in France. Even Americans inundate us with their history. Alatriste is the proof that movies like that can be made here. And if the means are available, we can make movies with the best of them." It's not a question of nationalism. (And what if it were? But it isn't.) It's more a problem of common sense. It's not about whether our stuff is better or worse, but to find out why our history, our myths and legends, our historical and fictional heroes are much less represented in our own movies and that's why we adopt characters from other cultures as our own. What does General Custer have that other generals in our history didn't? Didn't our monarchs go on the Crusades? Didn't our sailors win battles? Or is it that there aren't any Jack Ryans or James Bonds in our secret services? When's the movie about the Civil War going to be made? Can't Superlópez surpass Superman? Where are the Spanish heroes? Why don't they show up on our screens? "The setting is 100% important and we can't forget that it's another character in the movie." The adventures of Captain Alatriste were born of a happy idea by writer and journalist Arturo Perez-Reverte, a former Television Espana war correspondent who is extremely well-read and occasionally polemic but always extraordinary. There are five novels of adventure (another two are in the works) wherein this soldier of the Flanders Army, who survived terrible hardships in the days when Madrid was ruled by the Austrian Hapsburg Dynasty, in the middle of the 17th century, when the Spanish Empire was living the last days of glory and shadows were falling across its past splendour. It began almost like a game. The writer, convinced that the century was key to explaining many things that are happening in the present day, including the character of modern day Spaniards, dived into researching the 17th century along with his daughter, Carlota, who was in charge of assisting him with the historic documentation for the first book. Di­az Yanes' film isn't a carbon copy of the novels, nor is it a lightweight adaptation. It's much better. It draws from each and every one of the five published novels, (El Capita¡n Alatriste, Limpieza de Sangre, El Sol de Breda, El Oro del Rey and El caballero del Jubon Amarillo). The director even dares to propose an ending that hasn't yet been written. Diego Alatriste has been born into a Spanish Empire subsumed by decadence. Felipe IV reigns, a monarch who has inherited an immense Empire that stretches from America to South East Asia, and which has territories all across Europe including Portugal and The Netherlands. But the king prefers to spend his days hunting or deflowering young girls. And, nevertheless, in spite of the decline of an impoverished country, Spain is living an unprecedented artistic and cultural splendour: brilliant baroque music, painting, literature. Alatriste is a soldier in the Flanders Army, the king's elite fighting force, (something like American Marines), but after every battle the man takes to the streets in the capital of the kingdom as a hired assassin. He performs his task with great honour, yes, but he's a hired assassin, nonetheless. An atypical hero. He's a born survivor. Beside him, ever since he was a boy, is the son of a deceased Basque fellow man at arms who asked him to watch over his offspring, Inigo Balboa, who becomes Alatriste's right-hand man. Together, they will go through hell. "He wasn't the most honest of men, nor the most pious, but he was a brave man." According to the first line in Reverte's novel, he could be anybody. Reading the books and seeing the illustrations, we have a premonition. Seeing Viggo Mortensen, there isn't any further doubt. He is Alatriste. The director, who is also the script writer, doesn't doubt it, "He's been fantastic. It's not only that he's thrown himself into it completely; it's that, in addition, he's allowed me to make my movie. He hasn't interferred at all, unlike other stars might do. There wouldn't be a movie without him." Mortensen took a risk and even confronted his advisors, who thought it strange that a star of his calibre would come to Spain to make a period movie simply because he liked the script that his friend, Ray Loriga, handed him. Loriga had directed him in My Brother's Gun, 1997, based on Loriga's novel, Fallen from the Sky. The rest of the cast is spectacular. Unax Ugalde plays Alatriste's right hand man, the young Balboa (Nacho Perez, the scholar from La mala educacion, plays Balboa as a child). Opposing them are Italian Gualterio Malatesta, played by Enrico Lo Verso and the scheming Angelica de Alquezar (Elena Anaya), daughter of a nobleman and Inigo Balboa's lover (or maybe not, it's never really clear). Alatriste's love, an attractive actress, Maria de Castro, portrayed by Ariadna Gil. The hero's friends are led by Juan Echanove, playing Quevedo, who is always getting himself into trouble for his sonnets declaiming those in power and speaking out against Gorgora. Alatriste's fellow men at arms are played by great actors like Eduard Fernandez (the loyal Copons), Francese Garrido (Saldana, a constable) and Antonio Dechent. Above every else, seated in the highest circles of power and pulling the strings are Duke Guadalmedina (Eduardo Noriega), who owes several favours to Alatriste, the Inquisitioner Friar Emilio Bocanegra (Blanca Portillo, in a daring, sexually ambiguous role) and the Conde Duque de Olivares (Javier Camara), the king's confidante, the guy with his hands on the money, at any rate. Is anybody missing? If you're wondering about Antonio Resines, he was in a terrible motorcycle accident and couldn't take part in the film. Unax Ugalde has it clear, "The Empire is the only bad guy. Everybody in the movie is a victim of its decadence, but that same decadence is really interesting." And passionate, like the relationship between his character and Elena Anaya's, the movie's bad girl. "I'm not bad, I'm more of a strategizer," Anaya defends herself mysteriously. Their wild affair contrasts with the depth of love between Alatriste and Maria de Castro, the most famous actress in the country, and the object of the most powerful mens' carnal desires. "She's born into privilege, a woman about town who has access to things that others don't, a little like us in reality," Ariadna Gil admits, and, seeing that life was worth little back then, she comments that she feels fortunate to "have been born in this century." "It's the first time that this era is spoken about so truthfully, so realistically," says Blanca Portillo, who shaved her head to portray the most terrifying man of the time, the president of the Holy Tribunal of the Inquisition. "It's all so realistic that if the fights had to look shoddy, then they do, because that's how it was historically. People peed on top of each other, and that's depicted in the movie," Eduard Fernandez remembers, commenting on his delight with Diaz Yanes. "Tano is really smart and really generous. Thanks to him, the attitude of our movie industry is changing: everyone in the world of film is hoping that the miraculous Alatriste will succeed in launching Spain's movie industry," notes the brilliant Javier Camara, who has two scenes in which he has to embody the decadence of the Empire. All of them, with smiles on their faces, concur in their descriptions of Mortensen, his kindness, (every day he brought flowers, alfajores, mate for everyone) and his wholehearted dedication. "If Viggo eats mud, why shouldn't I eat it, too?" says Eduard Fernandez. "He has been the masthead," Blanca Portillo puts forth. But for Diaz Yanes, each actor has played an equally important part: "A movie, in the end, is the faces of the actors, and if you have the best, everything turns out all right: they've improved upon the characters I wrote. That's a luxury." An incredible encounter with the heir to the English throne, the Prince of Wales, in love with the Spanish monarch's daughter, puts Alatriste in contact with the highest echelons of power. That was the key to the character: "The story has a hero, but he's real. He's a soldier, but with powerful contacts. That's Perez-Reverte's greatest ability, to live in two worlds, that of the powerful and the miserable." The spectre of the Inquisition and the purity of bloodlines pursue him and only the siege of the city of Breda, in far away Flanders, allows him a temporary reprieve from his problems. When he returns, his love for Maria de Castro, who is also being courted by the king, and a secret mission on a ship full of gold, moored in Seville, a chief trading post with the Indies, get our hero and his friend Inigo in trouble again. Called to arms once again, the Flanders Army prepares to fight the French at the battle of Rocroi, the 19th of May, 1643, the first time that the Spanish army was defeated and the one in which... Shhhh! This is a story that Spanish cinema finally dares to tell. Alatriste, (and also Ray Loriga's Teresa, and Los Borgia, by Antonio Hernandez, both forthcoming) takes on the Empire. Can they count on our support? Perez-Reverte's character doesn't have any need to be jealous of other superheroes. The hat: Like Indiana Jones, he's never without it. 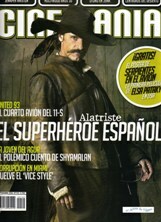 Alatriste wears it with panache. The brain: Like James Bond, Alatriste silences anyone who could compromise him and makes deals with shadowy underworld figures. Long live the cunning. The moustache: Resembling Errol Flynn's Robin Hood, Alatriste boasts a moustache that serves as a lonely guy's double-edged sword: capable of seducing and persuading. The cape: He doesn't fly, but at night on the streets of Hapsburg-ruled Madrid, he uses it to conceal himself. It's just like Batman and Superman's, even if it's a little more tattered. The sword: In the darkness, Alatriste's sword glows like Luke Skywalker's lightsabre. By day, his steel blade would be the envy of The Three Musketeers. The heart: Taciturn, brave, silent... As noble and loyal to his friends as Bogart's Rick Blaine, he throws himself into the only cause that's truly worth fighting for: honour.